Home > My Envy Box > My Envy Box August 2014 Edition, Photos and Unboxing!! 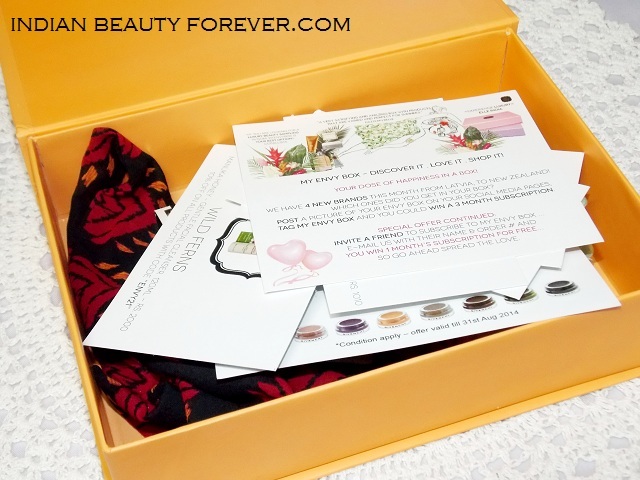 My Envy Box August 2014 Edition, Photos and Unboxing!! Got my “My Envy Box” a week ago but couldn’t post it on time. So, finally I will be unveiling what’s there in this month’s box of joy. Yeah, these cute boxes are no less than box of surprise and happiness!! This month My Envy Box team have added 4 new brands from Latvia to New Zealand giving us 4 extra brands to explore in the upcoming boxes. I was extremely excited to unwrap the box quickly and find out what brands and products I got in this month’s My Envy Box. Let’s begin to explore and unveil. It’s a light and ultra fresh gel that is a true burst of hydration to help revitalize the skin. It’s cooling gel texture relaxes and soothes the skin for a more radiant complexion. The gel provides 24 hours of hydration, leaving the skin immediately refreshed and soothed. I will try these when my skin behaves badly and gets stretchy and dry in spite of being combination to oily throughout the year. The full sized product costs Rupees 2990 for 50 ml. 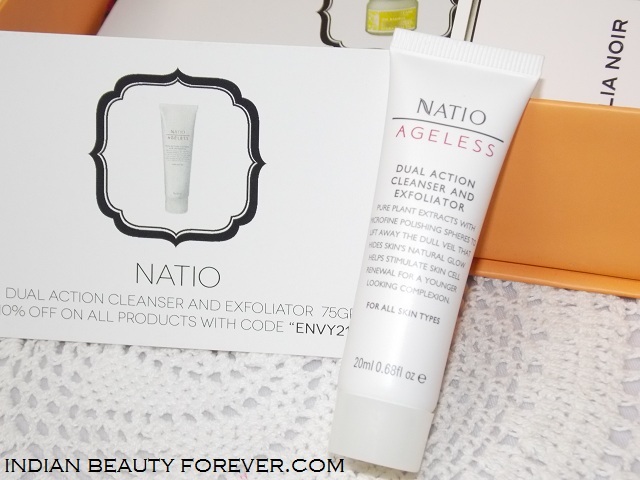 Natio Ageless Dual action Cleanser and exfoliator. This cleanser gently exfoliates with Micro fine polishing spheres to reveal a younger looking skin and complexion. It polishes and tones to help minimize the appearance of the fine lines and pigmentation. The full sized product costs Rupees 1010 for 75 ml. I can never say to exfoliators therefore, I will be definitely using it. It’s an okayish sized tube that will help judge the product really well before coming to a decision to get the full sized one. Natio is an Australian Brand. 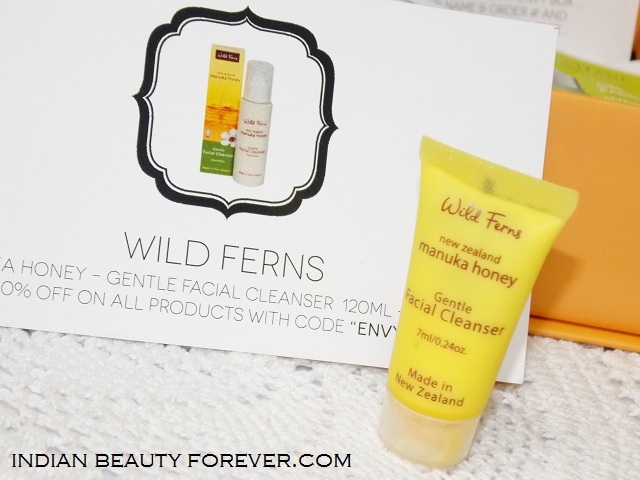 This gentle facial cleanser contains pure active extracts of Manuka Honey, this facial cleanser provides a deep cleansing treatment and effectively removes impurities and makeup from within the pores without removing the skin’s natural oils. Full sized product costs 120 ml for 2000 Rs. This Brand is from New Zealand. The eye cream is infused with concentrated plant molecular energies specially created for mature skin. 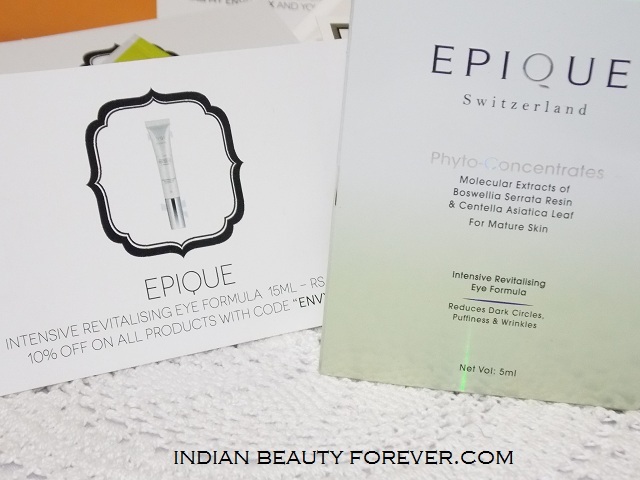 It repairs the delicate eye area and rejuvenates the under eye skin. It’s a brand from Switzerland. Full sized product costs 3200 for 15 ml. I liked this fragrance with citrusy and sweet peachy notes. Full sized of for 6040 Rs for 50 ml. 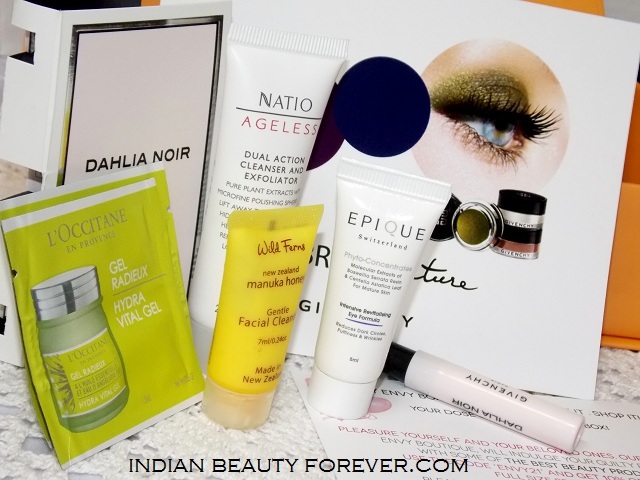 This month’s box gave a chance to explore some of the brands that were new for me therefore, it would be good to expose myself with these new brands. I find this month’s box interesting due to these new brands. I liked Natio exfoliator the most. 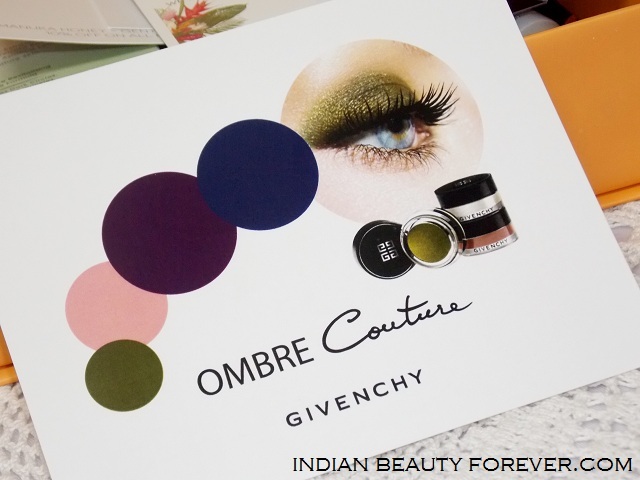 Apart from these, they also included this Givenchy coupon that entitles for a free eye makeup consultation at the nearest Givenchy counter. Wonderful!! 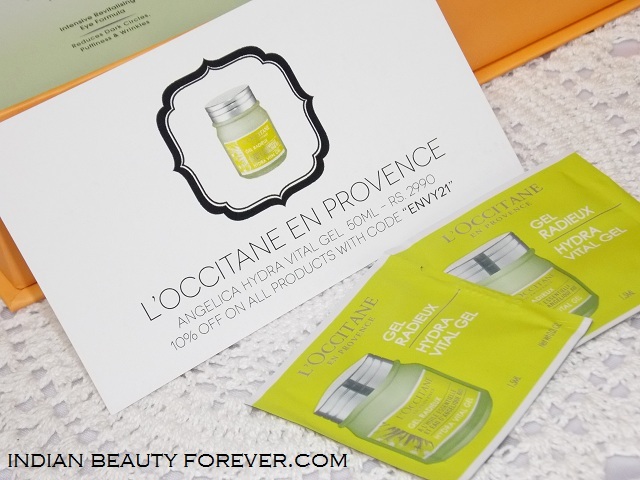 To explore and try high end luxury brands, My Envy Box is just the perfect option. 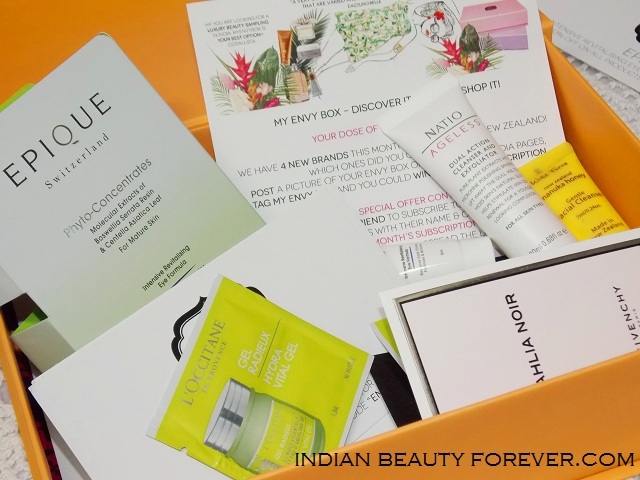 The pretty box further imparts a luxurious feel. 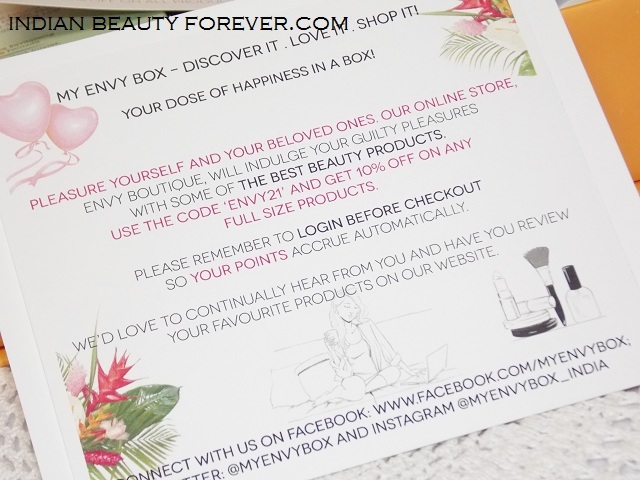 By the way, if you’ve received your "My Envy Box", then don’t forget to share the picture of your box and tag My Envy Box, you could just get lucky and 3 Month’s My Envy Box Subscription for free can come your way. Exciting!! Huh! I like what I see. Great content of a small box. I am very curious of each product, but in special of the Givenchy perfume! this looks nice to try few luxurious samples!